LONDON — The chairman of a British Parliamentary committee investigating Facebook and Cambridge Analytica‘s alleged misuse of user data said Tuesday that the suspended CEO of Cambridge Analytica, Alexander Nix, had pulled out of testifying before the committee on Wednesday. “His legal representation has said that he’s now not able to give evidence to the committee tomorrow, as a consequence of him having been served an information notice, and being subject to a criminal investigation by the Information Commissioner’s Office,” Damian Collins, chair of the Digital, Culture, Media and Sport Committee, told Tuesday’s session of the committee. Collins said his committee would consider a formal summons for Nix to appear. The committee press office told CBS News that no alternative date had been set for Nix to appear as yet, but that members would decide how to proceed over the course of the week. Cambridge Analytica, the analytics firm at the center of the Facebook privacy and data handling controversy, had its office in London searched by British law enforcement officers last month. A U.K. court granted the search warrant in March to search Cambridge Analytica after news reports that the company used data acquired from 50 million Americans’ Facebook profiles for political messaging campaigns. The investigation is part of a broader look at whether personal data was taken improperly. With Nix suspended, Cambridge Analytica’s acting CEO Alex Tayler apologized in March for allowing the Facebook users’ data to be obtained via an app and said the company would submit to an independent audit. Meanwhile, a former Cambridge Analytica employee who did make it into Parliament on Tuesday to face questions from the same committee revealed that “many” more Facebook users may have been duped into providing data to analytics firms than previously disclosed. Facebook said on April 4 that the number of users whose data was swept up by Cambridge Analytica could be as high as 87 million, significantly more than the figure of 50 million that was widely reported at the outset of the data scandal weeks ago. In a blog post, Facebook’s Chief Technology Officer Mike Schroepfer said the company believed data from up to 87 million people was “improperly shared” with Cambridge Analytica. Until Tuesday, all of the misused data was believed to have come from Facebook users who filled out the questionnaire on the “This Is Your Digital Life” app. That is where the 87 million figure came from. 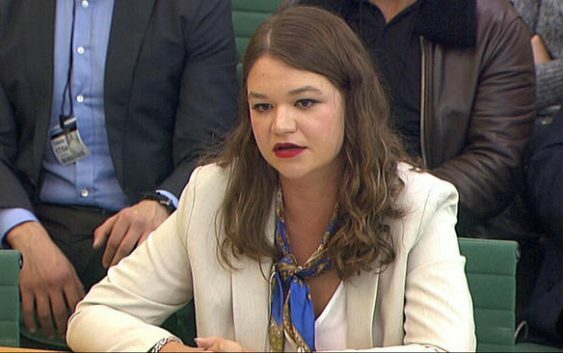 Brittany Kaiser, former Director of Program Development at Cambridge Analytica, speaks to Parliament’s Digital, Culture Media and Sports committee in Westminster, London, April 17, 2018. Revelations of improper data mining, which the company accomplished by exploiting a Facebook loophole, have stirred public outrage, multiple state investigations of Facebook’s data-protection practices and calls for CEO Mark Zuckerberg to appear before Congress.